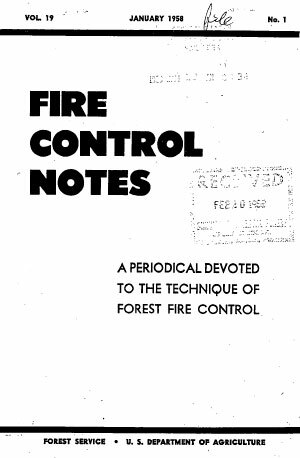 —adapted from the January, 1958 issue of Fire Control Notes, vol. 19, no. 1. The purpose of this large fire overhead training outline for the crew boss is to help him know more about blowup conditions and safe practices to use. Blowup fires and safe practices to follow have always plagued the crew boss. The importance of the problem has again been pointed out by fire accidents during the past several years. There is need for practical, clear, concise instructions to the crew boss on this subject. As a start, the best available information has been listed and recorded in this outline. A blowup condition is defined as an explosive, violent fire behavior that is difficult to identify before it occurs. Instruction steps and key points to stress in fire behavior fundamentals. Instruction steps and key points for indicators of dangerous fire behavior (blowups). Instruction steps and key points for the crew boss to follow for safe practices. It is extremely important that the instructor use all experiences that can be brought to the attention of the crew boss to point out the key points and principles outlined in this training plan. It is recommended that a minimum of four hours be given each year to fire crew bosses on the subject of blowup conditions and safe practices. Example of introduction.—Successful fire fighting is based upon the knowledge of why a fire burns and what makes it spread. Fire is simply a rapid chemical combination of fuel, heat, and air. The basic principle of fire suppression is to remove one or more of these elements in the quickest and most effective manner. In order to do this, however, there must be some knowledge of the causes and reasons for fires acting as they do. The primary factors that influence the spread of forest or range fires are fuel, weather, and topography. Fuels.—Fuels are commonly divided into two main groups: (1) Flash fuels such as dry grass, dead leaves, tree needles, brush, and small bushy trees; and (2) slow burning fuels such as logs, stumps, deep duff. Weather.—Weather factors with which you as a fire crew boss will be concerned are wind, moisture, and to a lesser degree, temperature. Slope or topography.—Slope greatly affects the spread of fire in two major ways: (1) Preheating and (2) draft. Judgment is the major factor in determining the relative importance of all the elements which determine fire behavior. For example, continuity and arrangement of fuels are sometimes more important than volume. Given a certain volume of fuel, features of arrangement or position will influence spread as well as difficulty of control. If fuels are patchy, broken up by areas of thinner fuel, rocky or barren spots, the spread may be uneven and slow (blackboard illustration recommended). If these same fuels are partly on the ground and partly in the air—standing snags—spread may be by spotting, and with severe winds, this may cause a most difficult fire. It pays to look carefully at all conditions in sizing up a fire. The fire crew boss must take advantage of known methods of sizing up a fire at a given time and predicting what will happen as the fire advances or as changes of weather occur. Large amounts of fine fuel (grass, needles, moss, etc.) particularly where continuous and on steep slopes. Crown foliage dried by surface fire over large area. Brush and conifer tree foliage after prolonged drought. Unexpected calm. May result in winds shifting. High clouds moving fast may result in unusual winds on ground. Unusually high temperatures early in morning. Thunderheads above or in close proximity to fire usually lead to dangerous downdraft winds. If thunderhead is upwind of the prevailing wind, the danger is greatest. When slope becomes shaded, look out for downdrafts. If a fire is burning near a mountain or glacier (such as Mt. Hood), greater downslope wind velocities will normally occur. Keep an eye on smoke column. Winds may be blowing from different directions above tire. This could result in spot fires outside. Watch smoke column for an increase in wind speeds aloft. This leads to spotting, and gusty wind conditions may also result. Sudden changes in direction and/or velocity of wind when weather fronts move in. Fire behavior (which could lead to a blowup). Spotting ahead of fire or downslope below line being worked. Smoldering fires over a large area. Whirlwinds inside fire causing spots and creating intense, erratic burning. Broadcast crown fires in brush or timber. The crew boss has two main responsibilities: (a) To obtain an effective, fair day's work from his crew, and (b) to look after the safety and welfare of his crew 24 hours a day to the best of his ability. After instructing in how to recognize conditions leading to blowup fires, the training leader guides the group into sharing experiences in what safe practices to know and use to prevent injuries or loss of life during blowup conditions. As he puts across the following instruction steps and key points (which are numbered) he should (a) review with group and stress key points, (b) encourage crew bosses to relate actual experiences they have had on a fire to stress key points, (c) relate experiences he has had to illustrate points, and (d) use case histories of disasters or near misses. STAY ALERT. Be prepared for safe emergency action. Keep Your Head. Heads up: Look up, look down, look around. Know where the fire is and how it is behaving at all times. If necessary, use scouts or post lookout with proper communication. Know what danger signs to look for, including fatigue. Use your fire behavior know how. Think before acting. Pause, think, then act. Fire fighting is dangerous. Crew boss has a key job. Men are looking to the crew boss. Keep an up-to-the-minute plan of get-away action in mind. Act with decision and promptly when escape action is needed. Remember-a fireline is not usually safe until it is burned out. The spectacular fire may not be the most dangerous. The quiet-looking fire may be the most hazardous. Get weather forecast in morning. WORK and ACT as a TEAM. Keep crew together. Need to do this for clear, safe actions. Use action words: “Come here,” “Follow me,” “Keep together.” The crew boss is the leader. Don't assume anything. Crew bosses have said, “Let's go” and men have gone different directions. Know where all your men are. Men must follow all verbal orders and stick together when orders are given to move out. Have men keep handtools as they may be of value in providing protection. Assign most experienced, mature men for scouting and for lookout when in especially hazardous situations. Manage and control your men. PLAN GET-AWAY, including escape routes. Crew boss must always have in mind a clear-cut plan of action for fire blowups. Know in advance where you will lead your crew. If necessary, prepare and mark escape route in advance. Let your crew members know you are responsible for their safety. In the event of a blowup, pause a moment and size up the situation. Then think clearly, speak decisively, and act in a calm and deliberate manner. Remember danger potential of timber, brush, and grass fire fighting. Keep in mind open places such as rock slides, streams, burned-over places, meadows, alder patches, and gravel bars. One of the safest spots is burned-over area. If needed, dig in. When not possible to get into burned area, remember, men can travel faster downhill or along contour. Warning—Remember, winds usually blow downslope at night and fires can run rapidly downhill. If necessary to jump through burning edge of fire, have men lace hat or coat over face. Caution men: if clothes catch on fire, roll on ground in dirt to put out fire. Do not travel ahead of fires in direction of spread unless you are positive that a safe place ahead can be reached by crew. When not possible to get within burn, pick most open ground available and avoid dense brush, where men can become separated and go astray. After reaching escape spot, check to be sure it is safe from falling trees, snags, rolling logs, or rocks. Try to find a safe vantage point and post lookout. In any brush fire fighting, when working in advance of fire with dozer, build safety strip for retreat. In timber types, sharp ridgetops are good bet to get to if possible. Watch for safer topography, benches in steep country. As last resort, burn out and dig in. When at safe spot, remember suffocation has killed. Have men keep damp clothes over their noses and get next to ground. Where heliports exist, keep their location in mind.